Acids and bases have been known for a long time. When Robert Boyle characterized them in 1680, he noted that acids dissolve many substances, change the color of certain natural dyes (for example, they change litmus from blue to red), and lose these characteristic properties after coming into contact with alkalis (bases). In the eighteenth century, it was recognized that acids have a sour taste, react with limestone to liberate a gaseous substance (now known to be CO2), and interact with alkalis to form neutral substances. In 1815, Humphry Davy contributed greatly to the development of the modern acid-base concept by demonstrating that hydrogen is the essential constituent of acids. Around that same time, Joseph Louis Gay-Lussac concluded that acids are substances that can neutralize bases and that these two classes of substances can be defined only in terms of each other. The significance of hydrogen was reemphasized in 1884 when Svante Arrhenius defined an acid as a compound that dissolves in water to yield hydrogen cations (now recognized to be hydronium ions) and a base as a compound that dissolves in water to yield hydroxide anions. In an earlier chapter on chemical reactions, we defined acids and bases as Arrhenius did: We identified an acid as a compound that dissolves in water to yield hydronium ions (H3O+) and a base as a compound that dissolves in water to yield hydroxide ions (OH−). This definition is not wrong; it is simply limited. Later, we extended the definition of an acid or a base using the more general definition proposed in 1923 by the Danish chemist Johannes Brønsted and the English chemist Thomas Lowry. Their definition centers on the proton, H+. A proton is what remains when a normal hydrogen atom, loses an electron. A compound that donates a proton to another compound is called a Brønsted-Lowry acid, and a compound that accepts a proton is called a Brønsted-Lowry base. 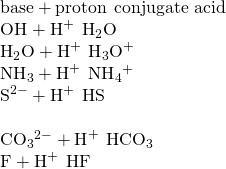 An acid-base reaction is the transfer of a proton from a proton donor (acid) to a proton acceptor (base). In a subsequent chapter of this text we will introduce the most general model of acid-base behavior introduced by the American chemist G. N. Lewis. This type of reaction, in which a substance ionizes when one molecule of the substance reacts with another molecule of the same substance, is referred to as autoionization. The slight ionization of pure water is reflected in the small value of the equilibrium constant; at 25 °C, Kw has a value of 1.0 10−14. The process is endothermic, and so the extent of ionization and the resulting concentrations of hydronium ion and hydroxide ion increase with temperature. For example, at 100 °C, the value for Kw is about 5.6 10−13, roughly 50 times larger than the value at 25 °C. What are the hydronium ion concentration and the hydroxide ion concentration in pure water at 25 °C? The hydronium ion concentration and the hydroxide ion concentration are the same, and we find that both equal 1.0 10−7M. The ion product of water at 80 °C is 2.4 10−13. What are the concentrations of hydronium and hydroxide ions in pure water at 80 °C? It is important to realize that the autoionization equilibrium for water is established in all aqueous solutions. Adding an acid or base to water will not change the position of the equilibrium. [link] demonstrates the quantitative aspects of this relation between hydronium and hydroxide ion concentrations. A solution of carbon dioxide in water has a hydronium ion concentration of 2.0 10−6M. What is the concentration of hydroxide ion at 25 °C? Thus, we can calculate the missing equilibrium concentration. The hydroxide ion concentration in water is reduced to 5.0 10−9M as the hydrogen ion concentration increases to 2.0 10−6M. This is expected from Le Châtelier’s principle; the autoionization reaction shifts to the left to reduce the stress of the increased hydronium ion concentration and the [OH−] is reduced relative to that in pure water. What is the hydronium ion concentration in an aqueous solution with a hydroxide ion concentration of 0.001 M at 25 °C? Write equations that show NH3 as both a conjugate acid and a conjugate base. Write equations that show acting both as an acid and as a base. Is the self ionization of water endothermic or exothermic? The ionization constant for water (Kw) is 2.9 10−14 at 40 °C and 9.3 10−14 at 60 °C. Brønsted-Lowry Acids and Bases by OpenStaxCollege is licensed under a Creative Commons Attribution 4.0 International License, except where otherwise noted.